Nick Boorman is restoring an early 65; especially intriguing as it is in the first 15 or so cars still in existence on the Survivors’ Register, but it was not registered until 1934 – towards the end of the 65 run. His dash top edge – the bodywork just above the wooden dash panel – is finished in a different manner to the majority of photographed 65s in that rather than a bluff flat plane bent around the ash frame and facing the driver, the aluminium bodywork behind the windscreen wraps around a wire creating a dull “knife edge”, which is supplemented by a black coloured alloy panel dropping to meet the dash at an acute angle of perhaps 35 degrees, with a rubber finishing seal against the wood. The effect is very pleasing and the lines more complex than the square-edged cars. Perusing images of some of the earliest cars here, there are few signs of this detail except in AOB444 [written ADB444 in the table, which shows the oldest 65s remaining, with chassis in 165-178000s, taken from Register in early 2015; orange signifies cars where photographs found] where one can possibly discern a faint similar outline at the edges of the dash. Chris Gould identified a Light Car road test from December 1933 which features ALE 578 (chassis 177459; bottom picture) and suggests the same “knife edge”. But we see that registration is very close to the top of the oldest remaining 65s still in existence. So was this a prototype feature? Nick Boorman writes: “I would think it must be a design option/prototype that was discounted on grounds of cost very early on. My car is one of the early numbers and may have been held back as it was different to those that had been sold or advertised. 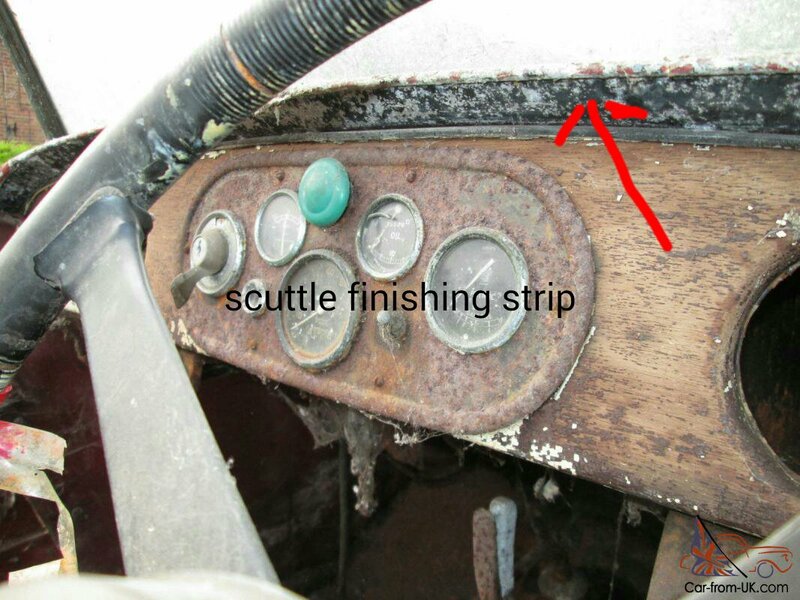 Ironically the only part of the car to go missing during the strip and rebuild is this scuttle trim panel; so any photos and fixing detail are especially welcomed”. Can anyone else provide images to support the hypothesis, or remember seeing something similar? Or know anyone who owns one of the early cars above, or perhaps others in that chassis number range which are not listed on the Register? After much head scratching and still not having definitely found another scuttle made in the same way I’m now happy we know how it should look. 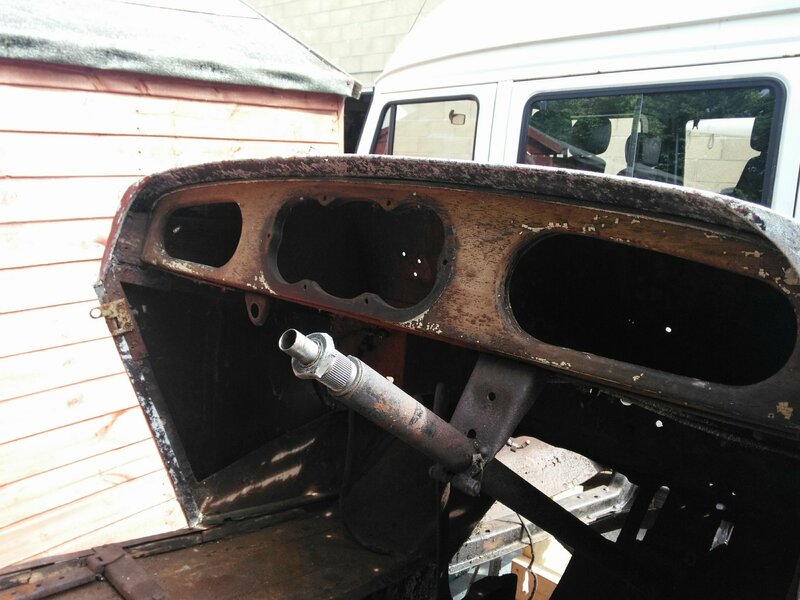 I had misread the photos of my scuttle believing that an aluminium filler strip sat between the scuttle top and the wooden dash panel. Looking at the car and the photos has now convinced me that what could appear to be that filler strip is actually just the oxidized underside of the scuttle top, and it changes from the body colour of cherry red on top to black underneath. Next Next post: Whatever happened to BDH 24?